The situation in Ukraine continues to be a major concern for the Belarusian authorities, while the prospects of Russia's air base is still uncertain as Minsk maintains its low-profile cooperation with NATO. Belarus is set to receive additional second-hand Russian S-300 missile systems but is unlikely to be the recipient of more modern systems anytime in the foreseeable future. In addition to the S-300s, Belarus is set to receive some additional transport helicopters from Russia. Belarus revealed that it is cooperating with China to design a multiple rocket launcher system and Belarusian special operations forces held a third set of military exercises with their Chinese colleagues. The authorities in Minsk are taking seriously the potential risk of the situation further destabilising in neighbouring Ukraine. In June, the Belarusian Army and Border Guard Committee spent several weeks testing a system of strengthening border control with Ukraine and the territorial defence system located in the Homel Province. The Belarusian Security Council emphasised that this exercise was routine, pointing to the fact that there was a similar exercise in 2014. The Chief Commander of the Special Operations Forces Vadzim Dzyanisenka also noted that the training they carried out had been planned long beforehand. The Security Council, however, conceded that Belarus had taken additional measures to guard its side of the Ukrainian border and formed an additional Mozyr Border Guard Unit last year. In addition, the scenario for the most training session included a battle with an armed band that invaded Belarus with the support of some local residents who underwent military training in a neighbouring country. This all suggest that Minsk had potential developments in Ukraine in mind when they drew up plans for the excercise. How Can Belarus Upgrade its Weaponry? Lukashenka and Raukou also raised questions about how to go about modernising Belarus's armed forces. Lukashenka stated that the army is already undergoing a third wave of adapting to new challenges through modernising it – the previous wave of 'adapting' apparently was apparently the result of the Arab Spring in 2011. Raukou also took time during the public discussion to discuss the testing of new rocket systems and other arms. The following day, on 16 June, the Chairman of Military Technical Committee Siarhei Hurulyou reported to Lukashenka on the positive results of a Belarusian multiple launcher rocket system in China. Lukashenka critically remarked that, “Our ally, Russia, is as active in supporting our aspirations [as China is].” The new system is believed to be being designed together with the Chinese and contains elements of the Chinese Norinco AR3 multiple launcher rocket system. Russia remains, of course, the main source of military equipment and related services for the Belarusian armed forces. On 17 June, the Belarusian Defence Ministry signed a contract with Russian Vertolyoty Rossii for 12 military transport helicopter Mi-8MTV-5. Belarus will get them in 2016-2017 and the helicopters will have the exact same specifications as those provided to Russia's armed forces. In July, one of the world's largest defence holdings, Russian KRET, started overhauling and modernising Belarus' land-based electronic countermeasures stations. Four stations revamped and updated by 2017. Back in June, Belarusian defence firm Agat-Sistemy Upravleniya founded a joint venture with the Russian firm NPO Kvant, which is a subsidiary of KRET. The new joint venture REB-Technology will modernise Belarusian and Russian armies' radio-electronic equipment. Raukou also announced that Belarus would receive four batteries of the S-300 surface-to-air missile (SAM) systems from Russia this year. These systems were previously deployed by Russian army who is now upgrading to the next generation of SAM systems, the S-400. Moscow and Minsk are in talks about Belarus potentially getting some S-400s as well, though at the moment it is unclear if it will. According to Raukou, in 2014-2015 Belarus signed "some 50 contracts [with Russia] for the supply, repair and modernization of anti-aircraft missile systems, communications, electronic warfare technology, small arms and artillery weapons, ammunition, aviation equipment for the needs of the Belarusian army", on very favourable terms. He said that a majority of the contracts have been fulfilled. On 17 June Defence Minister Raukou told the TASS news agency that Minsk believed the deployment of additional NATO forces and heavy weapons close to Belarus' borders created additional potential risks for Belarus. A day earlier, Lithuanian Defence Minister Juozas Olekas confirmed that the US was planning to store heavy weapons for up to 5,000 US troops in the Baltic countries and Poland. In the same interview, Raukou said that the issue of Russia's airbase in Belarus was on hold until a clear political decision could be made. This statement undermined previous public announcements by Russian officials to the effect that a Russian base would be established in Babruysk in 2016. Minsk has never been interested in having this airbase open up and least of all now when it could be used to provoke NATO and Ukraine. As a result of these heightened regional tensions, it is unlikely that a Russian airbase will be opened in Belarus anytime in the near future. In July, Belarusian delegation chaired by the head of the Belarus' General Staff Major General Aleh Belakoneu visited the regions where this year's joint military exercises with Russia will be conducted. The “Shchyt Sayuza” is held every other year, and this time around will take place from the 10-16 September in Russia. Minsk continues with its drive to diversify its international contacts in the military arena. On 31 May – 5 June NATO experts conducted a seminar in Belarus for men of the peacekeeping company of the Belarusian 103rd Mobile Brigade of Special Operations. In June, Raukou said, "The interaction of our country with NATO has a practical orientation and corresponds with our national interests, though does not affect our alliance with Russia." On 16 June, Defence Minister Raukou met the Secretary General of the Organisation for Security and Cooperation in Europe (OSCE) Lamberto Zannier in Minsk. They discussed military and political issues and signed a Memorandum of Understanding on a joint project concerning the utilisation of liquid rocket fuel. Besides trying to develop its ties with Western countries, the authorities are working hard to improve relations with China. From 15-27 June, Chinese paratroopers participated in a joint anti-terror training excercise with a company of the Belarusian 38th Mobile Brigade of Special Operations on a site close to Brest. This was the third such Belarus-Chinese training excercised conducted since 2011. 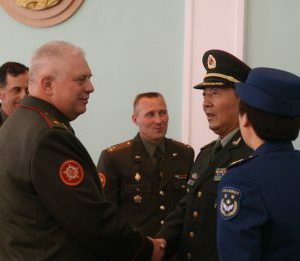 On 14-17 July, a Chinese delegation, headed by the deputy head of the Propaganda Unit of the General Political Department of the People's Liberation Army, Major-General Zhang Chanin, visited Belarus. Some military interaction occurred also with India and Qatar. In June, India gave Belarus 25 of its newest mine detectors, the Minelab X-Terra. Last year, India also gifted Belarus 60 radio sets and 30 GPS-navigation systems. On 2-5 July, Minister of State for Defence Affairs of Qatar, Hamad bin Ali Al Attiyah visited Belarus and met with President Lukashenka. Belarus has been cooperating with Qatar on security matters for years now, cooperation which has included Belarusian forces providing specialised military training to Qataris. On 13 July, the Council of the European Union once again removed restrictions against several Belarusian officials and entities subjected to an EU-wide travel ban and asset freeze. That decision amended Belarus sanctions listings introduced after the failure of Belarus authorities to meet OSCE commitments to democratic elections in 2006 and 2010. EU foreign ministers have already eased sanctions against Belarusian regime more than a few times. The current change in the EU policy toward Belarus resembles the rapprochement between Minsk and Brussels ahead of the 2010 presidential election. While the sanctions against the regime of Aleksander Lukashenka have failed to influence his policies, lifting them will not bring about positive change either. History has shown that the West’s mixing of pragmatic and normative approaches in dealing with the authoritarian regime has neither fostered closer cooperation with Belarus nor protected the democratic opposition from persecution. 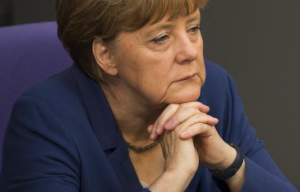 The war in Ukraine has dramatically changed the geopolitical situation in Eastern Europe. Minsk was thrust into the international spotlight when it hosted the cease-fire negotiations. Preoccupied with stability and predictability of domestic politics in the countries neighbouring the EU, Western politicians saw this as an opportunity for cooperation with the Belarusian president. The EU’s decision to extend its sanctions for another year until 31 October 2015 shortly after the Minsk Protocol on 5 September 2014 demonstrates its concern about the problematic human rights situation in Belarus. The reality of that ruling, however, is more complicated. Together with the decision to extend the sanctions, the EU’s foreign ministers also removed 24 persons and seven entities from the restrictions list. More than 200 persons and 14 entities have remained under sanctions, but among those removed are those regarded by many as key financial sponsors of the Lukashenka regime and Belarusian oligarchs – Uladzimir Peftijeu and Anatoly Ternavskiy. From the seven de-listed entities, in turn, three belong to Yury Chiz, another financial supporter of the Belarusian president, even though the owner’s name remains in the restrictions list. Since the post-election crackdown in 2010, the EU has de-listed more than 15 per cent of Lukashenka’s supporters and more than half of all sanctioned entities, not having received any concessions from the Belarusian government. Besides the lifting of restrictions against several persons and entities, the EU has removed sanctions against a state-owned Belarusian energy company Belarusneft, suspended the travel ban against Belarusian Foreign Minister Uladzimir Makiej, extended the invitation to the summit in Riga to Belarus and expanded visa services at the Embassy of the United States in Minsk. These clear signs of the EU’s warming toward Belarus were motivated not by the improvement of the domestic situation in Belarus but by the outbreak of war in Ukraine. Befriending Belarus: Did It Work Last Time? The EU’s current rapprochement with Belarus resembles the EU-Belarus thaw of 2008-2010, when the war between Georgia and Russia in 2008 made Russia’s neighbours, including Belarus, worry about the future of their own independence. The conflict fuelled the already ongoing disagreement between Russia and Belarus over energy prices. With the relationship between the EU and Russia strained and Lukashenka seeking better ties with the West, European foreign ministers decided to relax the restrictions on the Belarusian government in the hope of luring the country away from Moscow’s sphere of influence. The West was happy to reward President Lukashenka’s behaviour and initiated a thaw in the relationship with Belarus after the Belarusian government released political prisoners, granted legal status to the political movement of the former presidential candidate Alexander Milinkevich, and lifted the restrictions on two opposition newspapers. As a reward, the Belarusian president received invitation to a summit in Prague. At talks in Luxembourg in 2008, EU foreign ministers suspended a travel ban on Lukashenka and several his associates, introduced after the falsification of the 2006 election. In 2009, the EU’s Foreign Policy Chief Javier Solana paid a visit to Lukashenka to discuss bilateral relations and regional issues. That thaw did not end well, however. Up to 700 opposition activists, including seven presidential candidates, were arrested in the post-election crackdown. Shouldn’t We Learn From Our Past Mistakes? Tough sanctions have always pushed Belarus to the east instead of changing Lukashenka’s ruling style. In 2011, in an interview with BELTA, Lukashenka compared sanctions to flea bites, annoying but relatively minor and benefiting neither the West nor Belarus. In a situation when sanctions have not been an effective instrument of pressure on the president and the regime in Belarus, many Western policymakers seem to forget the lessons of the past and start daydreaming about the benefits of engagement with the incumbent regime. Belarusian authorities cannot make a geopolitical turn to Europe. Russia remains Belarus’ most important trading partner and absorbs almost half of Belarus’ international trade. Economic dependency of Belarus from Russia and interest of its president in preserving his political power will not allow for meaningful cooperation with the West. In fact, Moscow already declared its support for reelection of the incumbent president in the October presidential election. On 17 July, Russia approved $760 million tranche to Belarus, in accordance with the previously agreed loan programme. The loan will contribute to the strengthening of Belarusian ruble before the election. 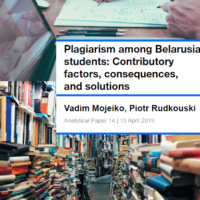 While Belarus appears more attractive than the engaged in turmoil Ukraine, trusting the words rather than the deeds of the Belarusian authorities and closing eyes to the human rights agenda ahead of the presidential election in Belarus would be a mistake. Tatsiana Kulakevich is a Visiting Assistant Professor in Research Methods and Quantitative Analysis at University of South Florida.